Decking material options are usually decided by the homeowner's preferences, the style of home, and expected deck usage. 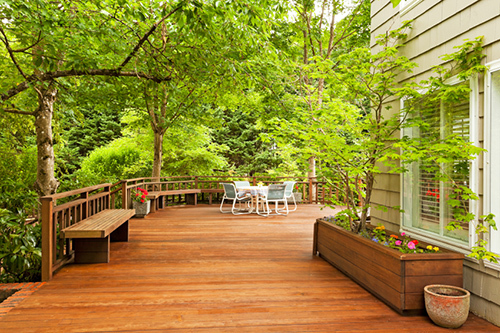 For many MV homeowners, wood decking is an ideal choice. Wood decks offer the natural beauty of real wood, with its distinctive wood grain and earth colors. Custom wood decks are strong & durable, and meet the challenges of our four-season Massachusetts climate. The natural insulating properties of wood decking help to lessen the absorption of heat in the summer, while the natural strength of wood stands up to harsh winter conditions on the island. We build many quality, low cost composite decks and vinyl decks for our Martha's Vineyard customers. Composite decking and vinyl decking is strong & durable, requires less maintenance than wood decking, and is available in numerous textures, colors, and shades.